I thought all Eagles fly? Is there a species of non flying Eagles? Nkono, Kunde, Massing, Tataw, Ebwelle , Pagal,Mbida, Mfede, Mbouh,Makanaky,Kana-Biyik,Oman-Biyik, Ekeke, Milla,.....Too Strong to be Intimidated, Too Stong to be defeated! Indomitable!!!! Marc Viven-Foe R.I.P!!! Flying Eagles today advanced to the 2019 U20 AFCON in Niger after they trounced Mauritania 5-0 to go through 6-1 on aggregate. It was a one-sided contest as the home team dominated from start to finish and deserved their big win. Enyimba winger Wasiu Alalade put the home team in front after 11 minutes to make up for an unpardonable miss a moment earlier. Aniekeme Asuquo scored Nigeria’s fourth goal, before the outstanding Afeez Aremu completed the thrashing in the 87th minute with a fifth goal from the penalty spot after a Flying Eagles attacker was brought down inside the box on his way to goal. Height / Weight:	160 cm. / 70 kg. PREVIOUS CLUBS. Gombe Utd Nig. Ikorodu Utd Lagos nig. PRESENT CLUB. Akwa Utd Fc Uyo Nig. Nigeria National League side, First Bank FC are close to securing promotion to the Premier League but the Bankers still have a final battle to overcome on the last day of 2014 season. 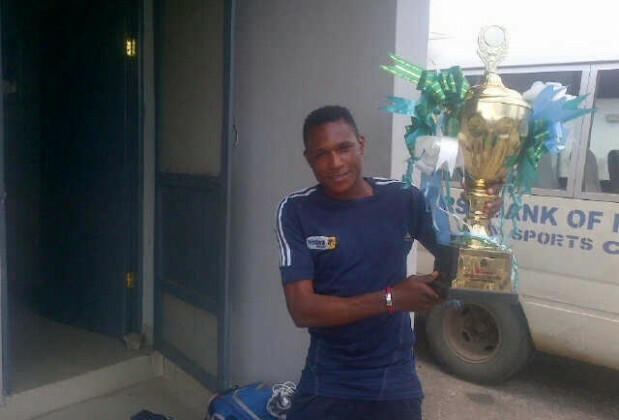 First Bank FC forward, Wasiu Alalade has stated that he is confident that his team will finish up the job in style. Alalade, a native of Ilemona Oyun in Kwara State joined the the Lagos base team this season and his goals have helped First Bank FC this term. He told sl10.ng that First Bank FC didn't just find themselves at the top of the log but rather sighted hard work, commitment from the team and team work for the club's fine form. “We didn't find ourselves at the top of the log by chance. Dedication, hard work, commitment, team work and God's grace has helped us. We are at the top of the log and this last match is one that we have to give our all and I'm confident of a positive result,” Alalade told sl10.ng. In NNL Group B, First Bank FC are first with 48 points while Akwa Starlet who are on the same point are second because of an inferior goals difference and 3SC of Ibadan occupy the third position with 47 points. Technically, one out of the top three will miss out of promotion depending on the result each team gets on the last day, but Alalade, who has scored ten goals in the league this season, insisted that his team is only focused on picking the maximum points in Omoku when they face NNL debutant Go Round FC who are battling to avoid relegation. “It's not yet over but our focus right now is solely on the match against Go Round FC, a win should see us through and I'm optimistic that with the determination and focus in the team we shall get a positive result by God's grace,” Alalade affirmed. The final day fixture will see second place Akwa Starlet, who are yet to lose a game in their last eight games, visit Ibadan, home of 3SC who have a 100% home record this term and also need a win to seal promotion while First Bank FC will travel to Omoku to face Go Round FC. The Oluyole Warriors need an outright win to secure promotion while a draw is enough to see First Bank FC to play in the Premier League next season. Detective txj, over to you. Do you still want to continue or apologize? Now this is what am talking about...this is how we roll it back in the day. For what? Posting the bio of a FE player's brother? You were too late in making the request, as I have since passed the investigative research baton over to YemiBrazil and Zee. Any particular reason for posting this bio? Hopefully, the new Onikan stadium will be much better than this rubbish Agege Stadium. my broda, we all get it wrong from time to time, no shame in that. Man up and move on. Another group of players that will not amount to shyt. Some of you morons just don't know when to hold back. Rough upbringing I'm guessing!